I can still remember the first time I had Laphroaig. It was a bottle of Laphroaig 15, and it was my third bottle of Scotch I had ever purchased. 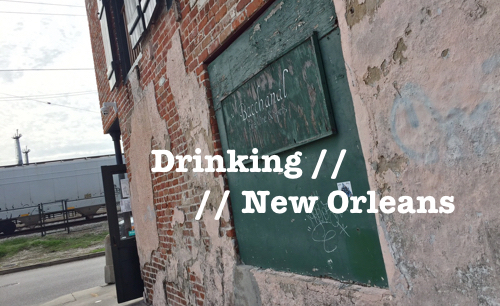 It’s not easy to forget the way that peat hits you on your first time. Unfortunately, you won’t find the 15-year around anymore. It was replaced by the 18 year a few years ago. But what you will still find is a very active Laphroaig distillery, cranking out some great stuff year round and bringing new bottles and profiles into the mix. 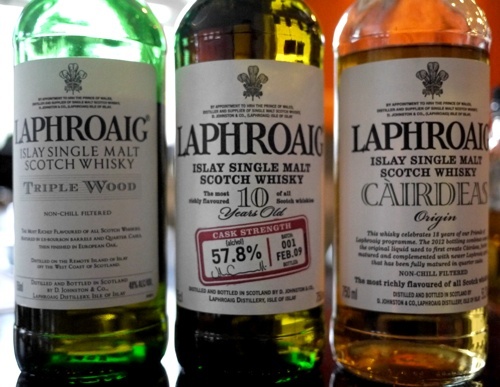 Triple Wood and Cairdeas are two of Laphroaig’s unique newer annual offerings that have found a solid footing in the past few years. I’m taking a look at these two whiskies today, along with one of my all-time Laphroaig favorites: the 10 year cask strength. Peat is a funny thing. It creates a flavor profile that is often a deterrent in early stages of Scotch drinking but can quickly become a craving the more you drink it. When it comes to peaty whisky drinking – no matter what level you’re at – Laphroaig is about as good as any distillery about creating whiskies that truly capture the essence of peat. Their entry level, the regular 10-year release, is easily one of the best single malt’s in the $40 range, and if you’re looking for a great whisky at any price to tame your peat urge, this should be on your shortlist. 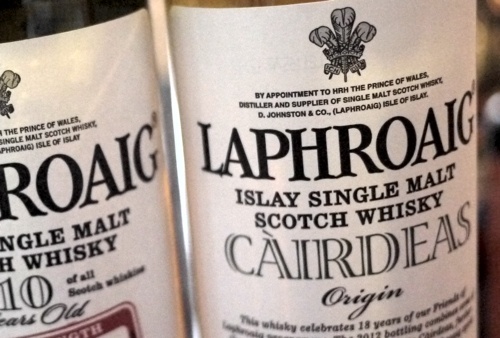 One of Laphroaig’s newer entries to the market is Cairdeas, a unique offering that can be a bit hard to track down. Prior to 2011, Cairdeas was a private bottling for the Friends of Laphroaig, but for the past two years they’ve made this a limited annual release for the public. The 2012 version that I’m tasting today, Cairdeas Origin, is a blend of whisky from the first Cairdeas barrel, including whiskies ranging from 13 to 21 years, and some younger seven year-old spirit. On the nose you immediately get a sweeter fruit component that jumps out of the glass – spicy orange marmalade, lemon and apple. Of course, there’s plenty of briny peat smoke to balance out the sweet, and together the sweet and smoke marry nicely. On taste, dried fruit notes pop through a heated palate. 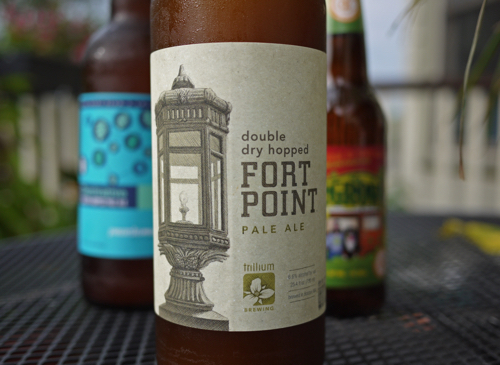 A few drops of water tame the 51.2% and open up woody vanilla, honey, and meaty coal smoke. There are some spice notes as well, including a little red chili pepper, which I found to be quite interesting. If you’re a big Laphroaig fan and you like that ocean-slapped peat in all its form, this is a nice addition to the lineup. In my opinion, not nearly as complex or full flavored as the 10-year cask strength, but definitely an interesting annual release that’s worth keeping an eye on. 88 points. 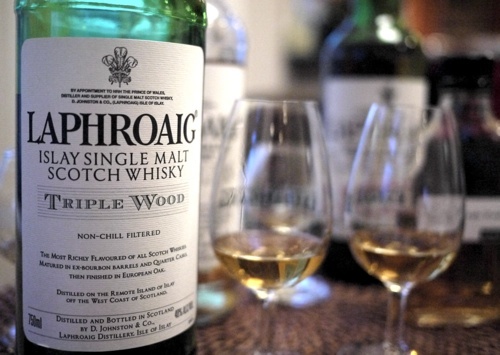 Triple Wood is another unique release from Laphroaig. This whisky was originally released a few years back for travel retail only, then was opened up for public release in the US in 2011. I picked up a bottle of the 2011 Triple Wood when it first came out and recently acquired a sample of the 2012 release. In short, this whisky is a triple matured spirit that has gone through American ex-bourbon barrels, Quarter Casks and finally large Oloroso Sherry casks. There’s definitely a relation to the regular Quarter Cask release, but the Sherry maturation adds some new notes which I find to be quite nice. On the nose the 2011 has a rich, deep medicinal smoke, while the 2012 has a little higher pitched, briny bacon smoke. They both have a good amount of dry wood notes. 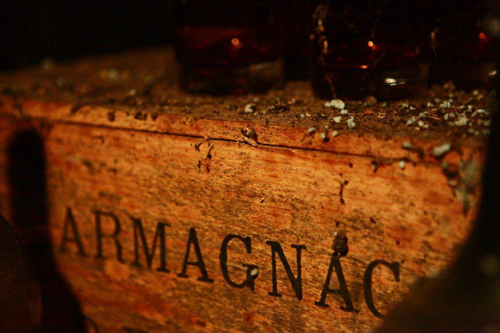 On the palate, the 2011 is smooth and peppery, with a rich sweetness from the Sherry cask. Dried orange, berry and apricot notes balance the heavy charcoal smoke nicely and the whisky builds into a sweet and spicy finish. It’s just that right balance of smoke and Sherry – not an overkill of either and very enjoyable. 89 points. The 2012 is similar on the palate, perhaps just a bit spicier, with a little richer Sherry profile. 90 points. I’m a big fan of both of these whiskies. If you like Sherry in check, spice and Laphroaig peat smoke, you’re going to like this whisky. 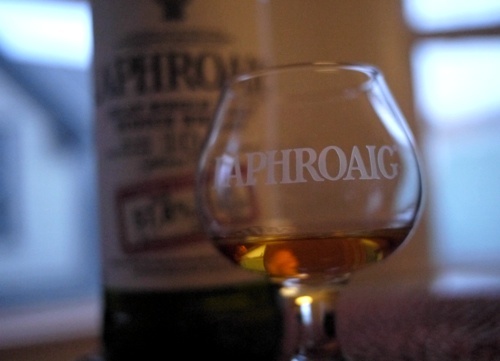 Laphroaig is virtually synonymous with peaty Islay whisky. And with some of these recent additions to their lineup, they’ve secured this reputation even further. Thanks to Ryan at JSH&A for the samples. 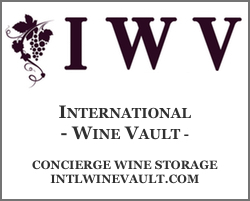 Next ArticleWin a Pair of Tickets to the Boston Wine Expo and Make your Valentine Happy!